England’s top flight is a merciless environment to work in, according to midfielder Steven Defour, but the Clarets are making it even tougher for themselves. After making their worst start to a Premier League campaign, taking nine points from their opening 13 fixtures, the former Belgium international has identified the root of their problems. Monday night’s game against Newcastle United at Turf Moor was the eighth time this season in which Burnley have conceded the first goal and gone on to lose. 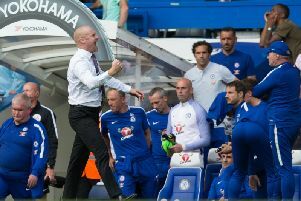 The 30-year-old, signed from Anderlecht in 2016, has stressed the importance of getting ahead in games with Sean Dyche’s side taking seven points from the three games where they’ve got their noses in front. “We need to score the first goal; that changes a lot,” he said. “We need to show more confidence. “Sometimes we have some good pockets but when we get in to the final third we don’t know what to do. We need to get back to how we used to play. “We’re showing signs but when you concede you have to start all over again. You end up having to chase the game, you’re having to go forward and start taking more risks. Burnley are a point off bottom, they’re 13 points shy of their total at this stage last season and they’ve conceded 17 goals more. Defour acknowledges that this term is going to be a battle but it’s one he says the squad will be up for in a bid to preserve their status at this level. He said: “We’re not getting that bit of luck that we had last year. We have to keep working in search of a response. “Last year everything went for us and this year it’s not really going for us. “We have to step up even more like we did last year. When the results aren’t going for us some start doubting which isn’t a good sign. “We have to do more but that comes with confidence and that comes from goals and wins. We just have to work hard and make things go for us. “We have a lot of players who like to battle.